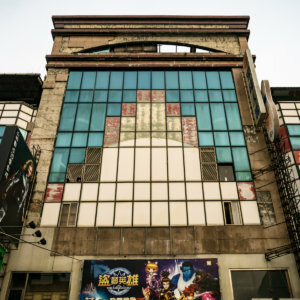 The rundown facade of the Míngzhì Building 朙志樓 in Taichung, notable mainly for the use of a rare character in its name. The journey begins under ominous skies in Taichung. 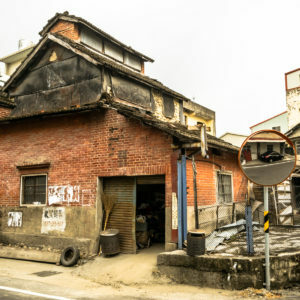 The journey began after picking up a scooter near Taichung Station and crossing underneath the railway tracks. I was starting later in the day than I would have liked—and the weather forecast was not promising, as the ominous skies in several of these photos would suggest. 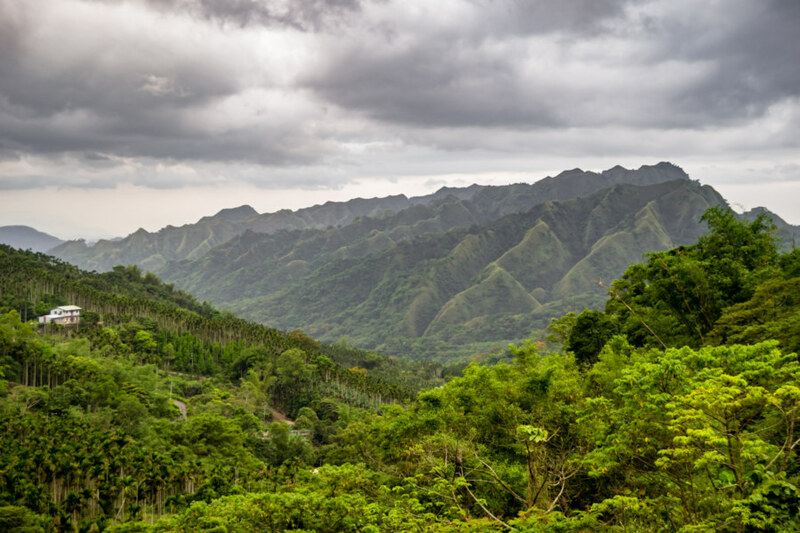 After taking a similar trip two years prior to this I was intent on trying a new route to Nantou, one that involved riding into the mountains, so I kept a close eye on the radar to ensure I didn’t end up caught in a torrential downpour far from shelter. With this on my mind I paused to snap a picture of the impressive Guānyīn 觀音 statue in front of Címíng Monastery 慈明寺 while exiting the city. 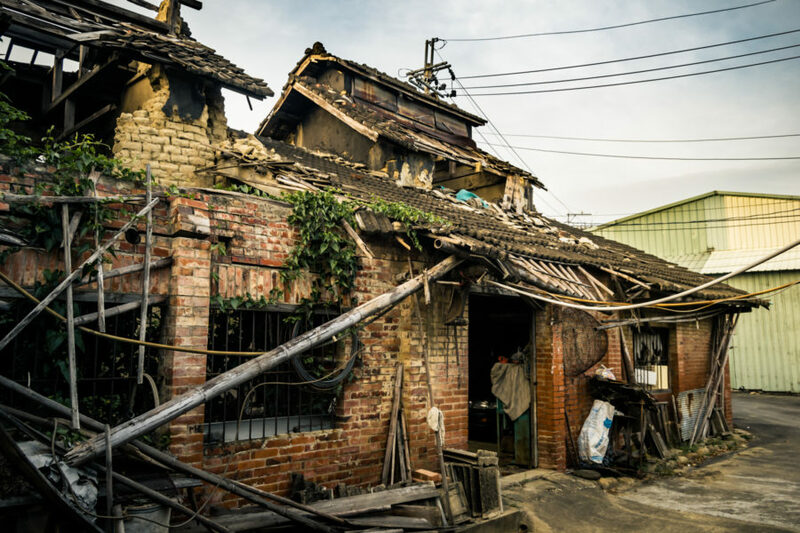 Late into the afternoon at the Dongping Tobacco Barn. I made a few stops on the way into the mountains, mostly to check up on some places I had already visited earlier in 2017. 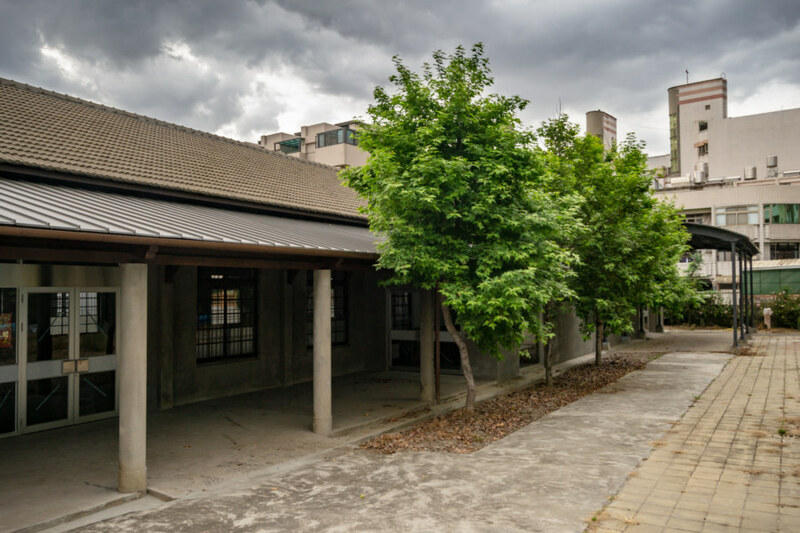 The first of these was the historic Taiping Tobacco Market 太平買菸場, an unassuming building still undergoing restoration work (and opened to the public since then). 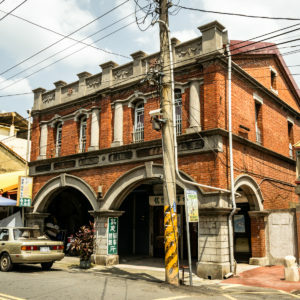 The Taichung Basin 臺中盆地 was once home to a thriving tobacco cultivation and manufacturing industry, several remnants of which have already been documented at length on this blog, but this is the only surviving tobacco marketplace. 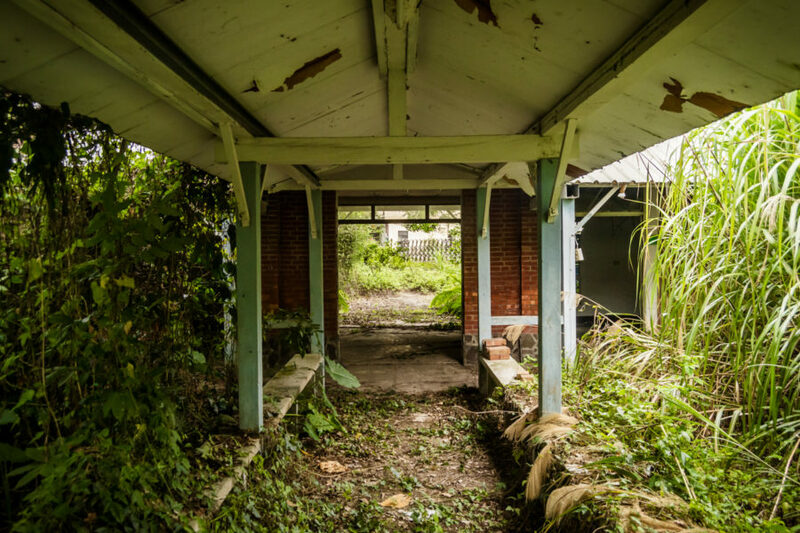 Not far up the road, if you know precisely which alleyway to take, you’ll also find the ruins of one of the few remaining tobacco barns in the area. 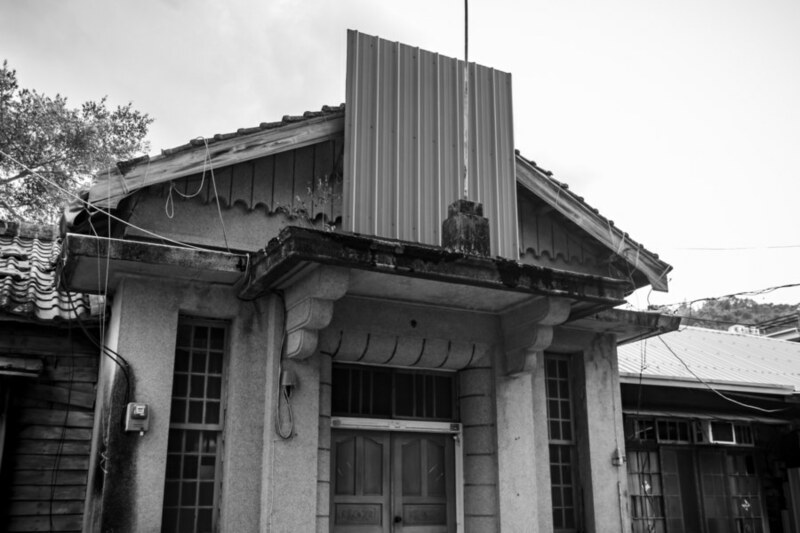 Checking up on the Japanese colonial era Toubian Police Station 頭汴派出所. 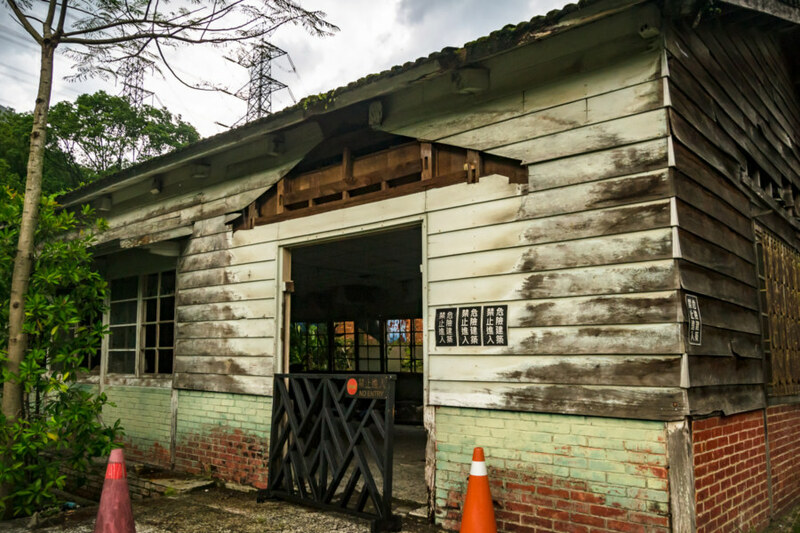 Further east, nestled in the low hills just beyond the edge of the basin, you’ll find the Japanese colonial era Tóubiàn Police Station 頭汴派出所, abandoned but still in decent condition and slated for restoration. I captured much nicer photos in better light on a previous trip so I’ll write more about this heritage building at another time. 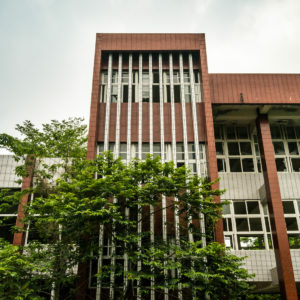 If you’re curious, have a look at my post about the Wuri Police Station, for the design and layout are pretty much identical. 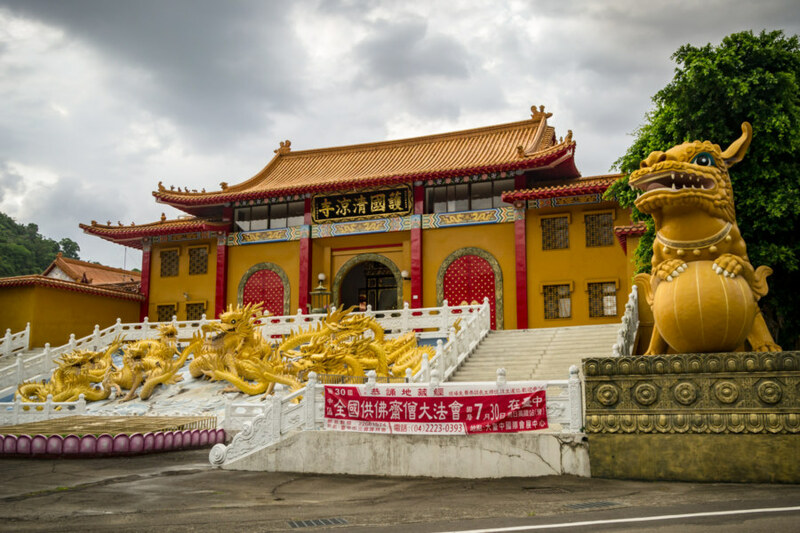 The entrance to Huguo Qingliang Temple 護國清涼寺, a sprawling complex in the hills above Taichung. The weather forecast looked somewhat better by the time I was departing the police station so I committed to riding Highway 136 (市道136號) all the way into Nantou. Heading higher into the hills I eventually reached the resplendent Hùguó Qīngliáng Temple 護國清涼寺 and dropped the kickstand to scope out the intriguingly-named Tóubiànkēng Bat Cave 頭汴坑蝙蝠洞. A quick inspection revealed nothing of interest apart from a rather cool bridge—but if you consult the previous link (in Chinese), you’ll learn the name is somewhat misleading. The “cave” is manmade; it’s an old water diversion channel, part of an irrigation system constructed centuries ago. 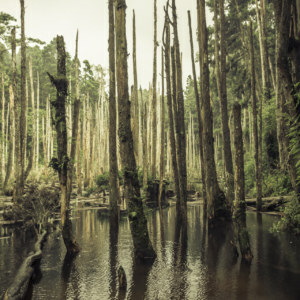 The channel was colonized by bats after it fell out of use—but from what I’ve read the bat colony dispersed in the aftermath of the devastating 921 Earthquake. 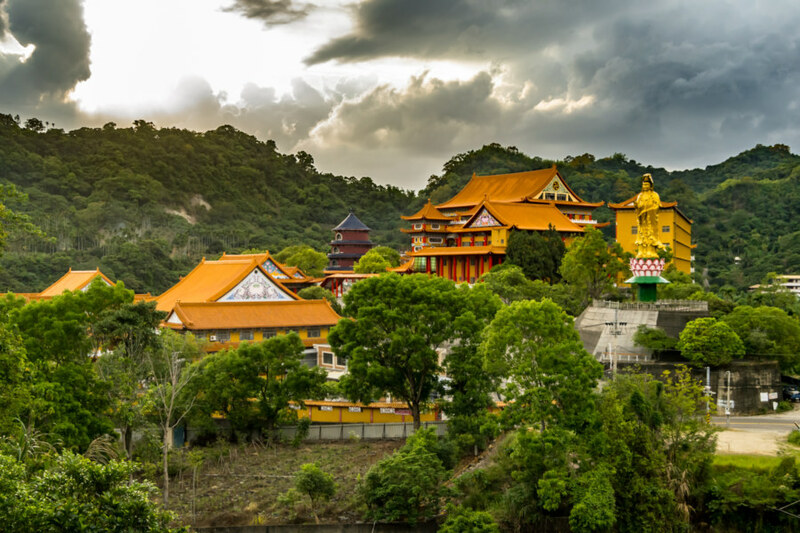 Sundown over a temple complex in the hills of Taiping District, Taichung. 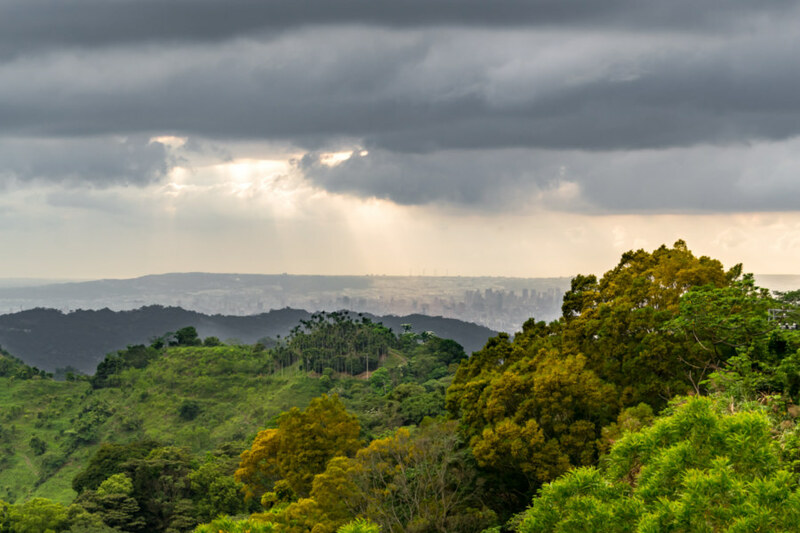 Downtown Taichung and the huge power plant on the coast are faintly visible in this image captured at Chikanding, an area popular with motorbikers and cyclists. Now leaving Taichung. I would not return for several months. Soon I crossed into Guóxìng 國姓, Nantou, and began the languorous descent toward Provincial Highway 14 台14線, the usual route to Puli (if you’re on a scooter or bicycle anyway). Along the way I enjoyed a great lateral view of the Ninety-Nine Peaks 九九峰, one of many unusual landscapes in central Taiwan. This rugged badlands terrain was completely denuded in the aftermath of the aforementioned 921 Earthquake, but the peaks were looking relatively lush while I swung through. Coming down into Nantou County alongside the picturesque Ninety-Nine Peaks. 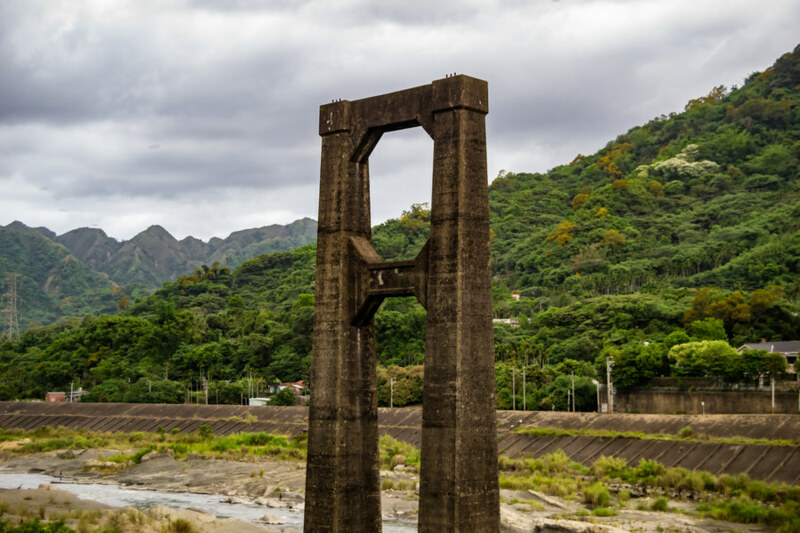 With darkness gathering I captured the last shot of the day: one of the old pilings for the Gānfēng Suspension Bridge 乾峰吊橋, heavily damaged in the 921 Earthquake but not replaced until 2008. 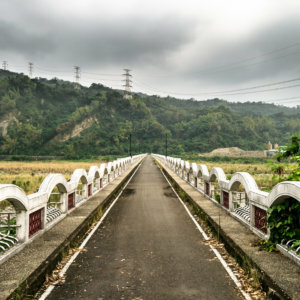 It originally spanned the Wū River 烏溪 (also known as the Dadu River 大肚溪), which marks the boundary between Taichung and Changhua 彰化 further downstream. 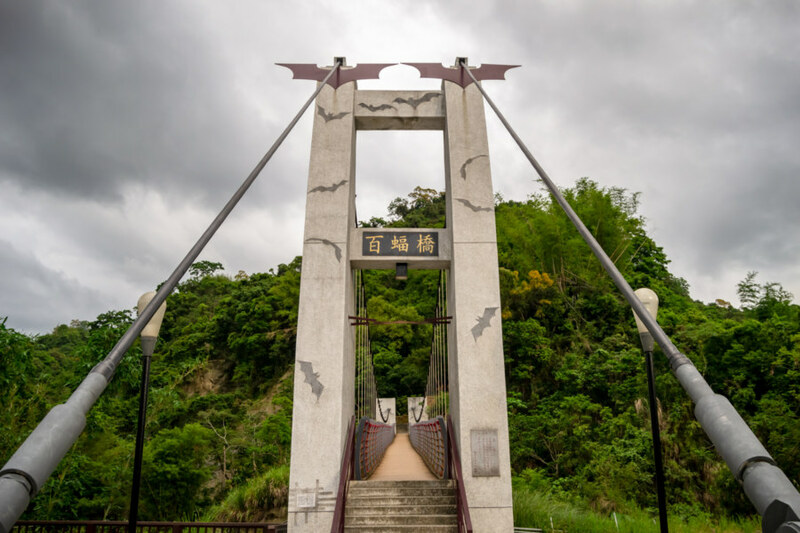 A relic of the former Ganfeng Suspension Bridge in Guoxing Township, Nantou. 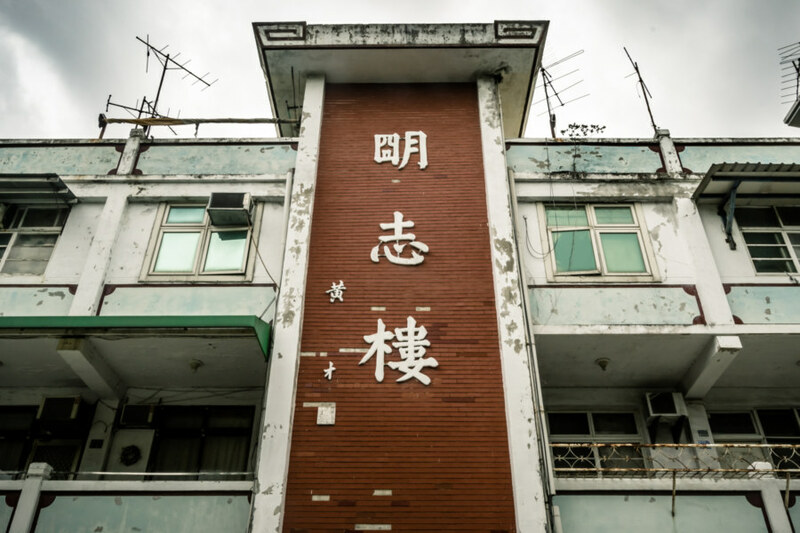 Stalking the corridors of a historic tuberculosis sanatorium in the mountains of Nantou. 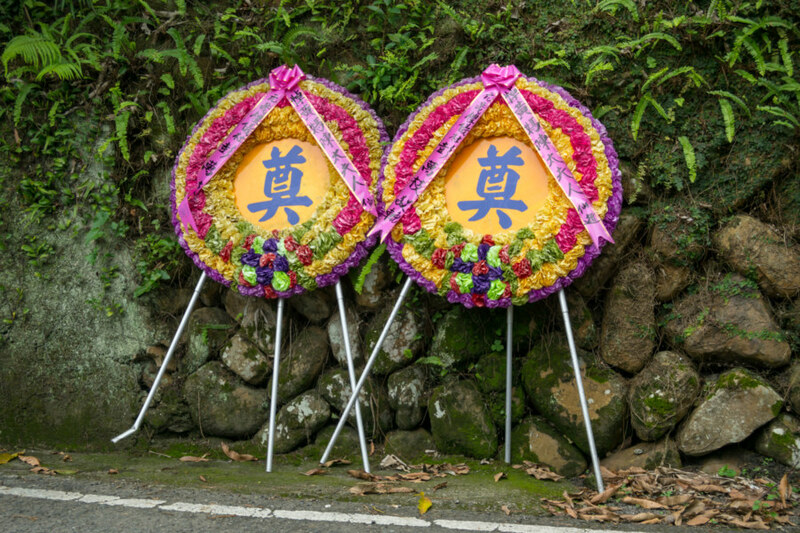 Funerary wreaths (sānglǐ huāquān 喪禮花圈) announcing a memorial service (diàn 奠), a regular sight in rural Nantou. The countryside is emptying out. 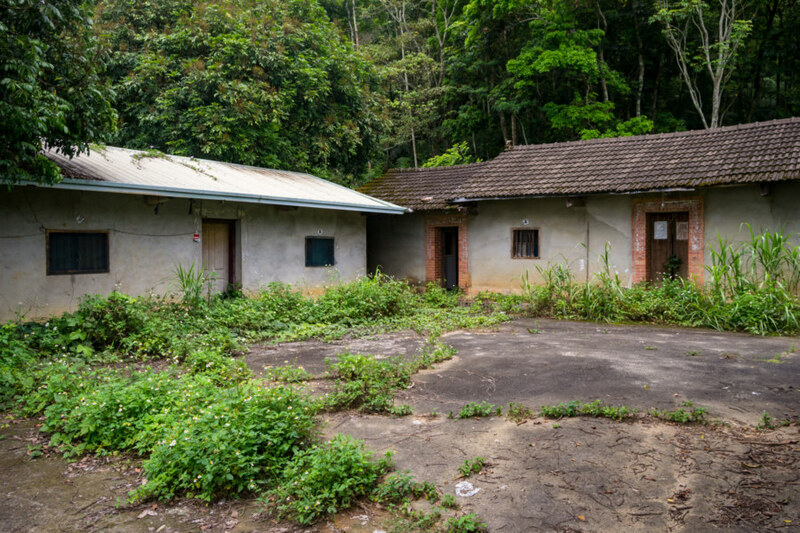 An abandoned farmhouse perched on a hillside in Táomǐ Village 桃米村. Once the music festival was over I went south by way of the scenic County Road 131 縣道131號. 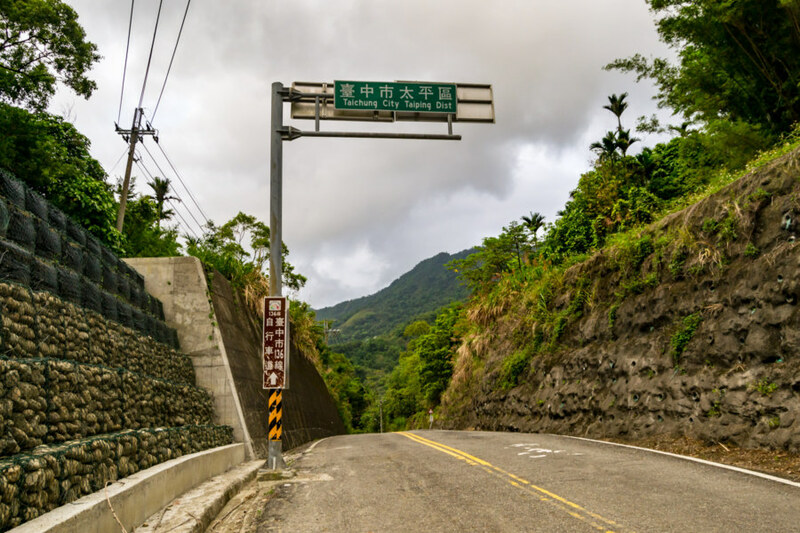 This highway connects Puli to Shuili by way of Yúchí 魚池, bypassing Sun Moon Lake 日月潭, an important reservoir for hydroelectric power generation, and also one of central Taiwan’s top tourist attractions. Although I didn’t visit the lake on this trip it will be referenced below, so keep it in mind. 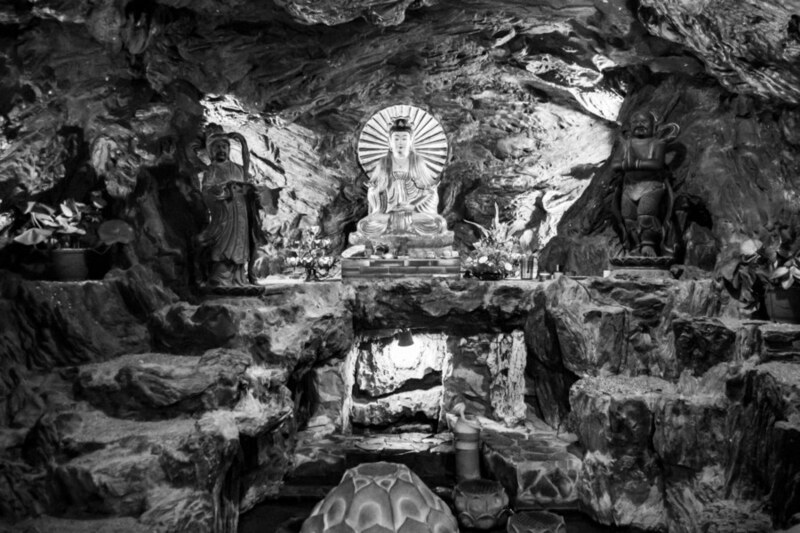 The legendary Guanyin cave beneath Jixian Temple on Highway 131. 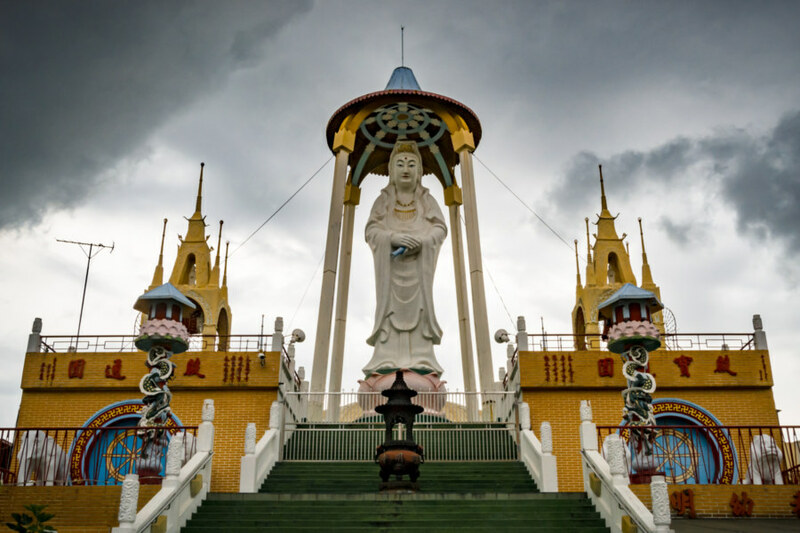 The actual image of Guanyin is located in the nook below the idol—but don’t expect to see anything, it’s almost unrecognizable even up close. Along the way I made a brief stop at the scenic Jíxiān Temple 吉仙宮, an impressive temple accessible from an unusual suspension bridge decorated with large stones. I’ve stopped here several times over the years but never knew what was so special about this temple until doing a little research for this article. Turns out that the cave beneath the temple contains a freshwater spring with legendary properties. The story goes like this: one day a camphor speculator1 fell ill, drank from the waters of this spring, and was cured. In a textbook example of pareidolia someone noticed that the rock face above the spring bore a passing resemblance to Guanyin, the Goddess of Mercy, and so the spring (and surrounding area) became known as Stone Guanyin 石觀音2. Minghu Reservoir and the Daguan Power Plant. Notice the pipes running up the hillside? They go all the way to Sun Moon Lake! Further south at the Mingtan Reservoir. This is the largest pumped-storage hydroelectric project in the country. 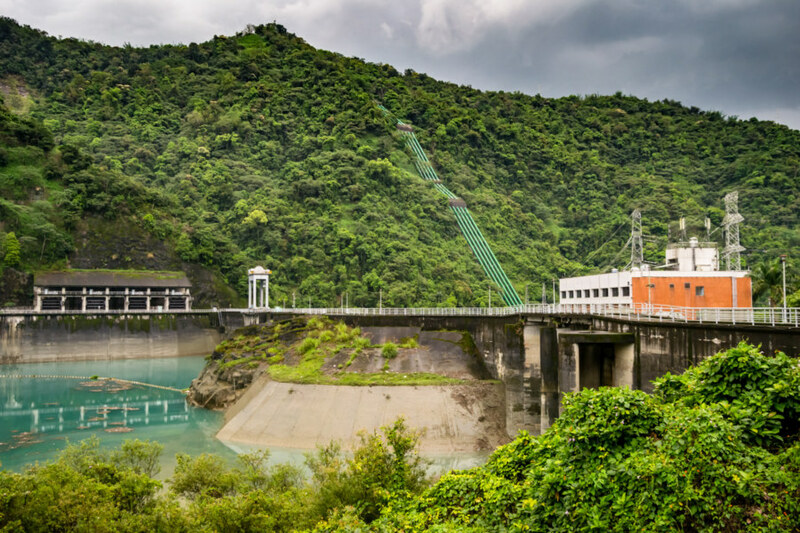 Next up: Taiwan’s only pumped-storage hydroelectric projects, both of which generate power from the waters of Sun Moon Lake. 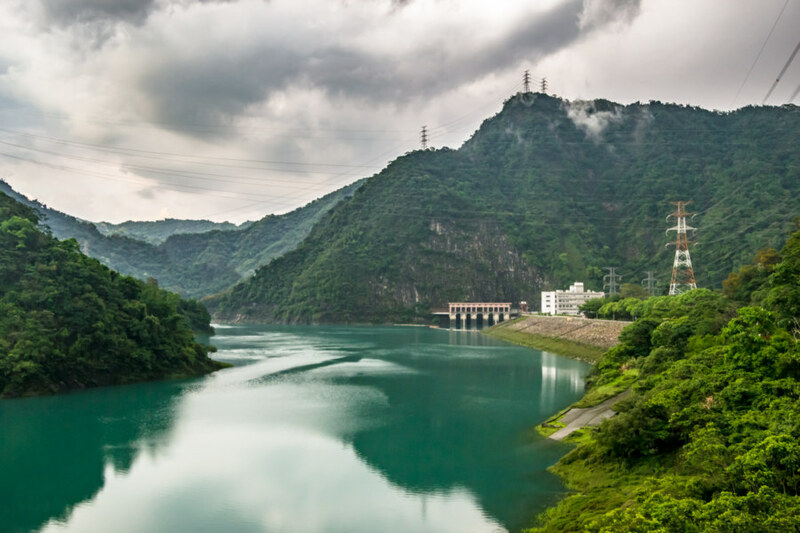 The method of action is simple: by day the power plants generate electricity by harnessing the gravitational potential energy of water descending from Sun Moon Lake into the reservoirs associated with each plant. By night, when demand is low, both plants pump water back into Sun Moon Lake, thereby helping to maintain the water level. 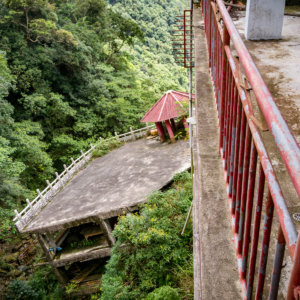 Mínghú Dam 明湖壩 and Dàguān Power Plant 大觀發電廠 were completed in 1985 whereas the larger Míngtán Dam 明潭壩 began operating a decade later in 1995. Together they account for somewhat more than 1% of the nation’s generating capacity. An unidentified ruin in Checheng Village. 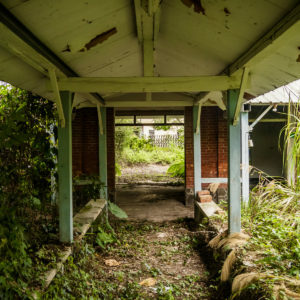 I strongly suspect this is the old police station since it’s right behind the current one but haven’t been able to confirm. While meandering around the top of Mingtan Dam it began to drizzle. 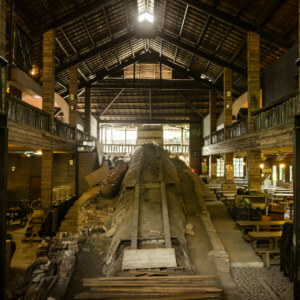 I hastily drove downhill to the historic logging town of Chēchéng 車埕, another place I really need to get around to writing about on this blog, at which point my luck ran out and the heavens opened up. 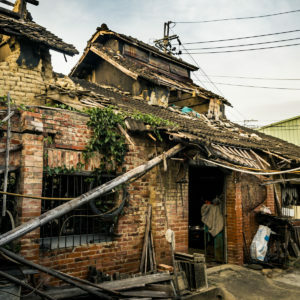 I stashed the scooter and sought refuge in one of my favourite restaurants in central Taiwan, the Wood Village Snackbar 木之村小吃部. Eventually the rain stopped and I continued on my way, but it was too dark for photography, with one small exception. Darkness falls on the small Hǔ Yé Temple 虎爺廟 in Shuili. While riding through Shuili on my way to Zhushan I noticed a sign for the Shuili Hǔ Yé Temple 水里虎爺廟. If you’ve been following me on Instagram you’ll know I have a fondness for Hu Ye, the Taoist tiger god found in most Taiwanese temples, so naturally I was interested in taking a closer look. 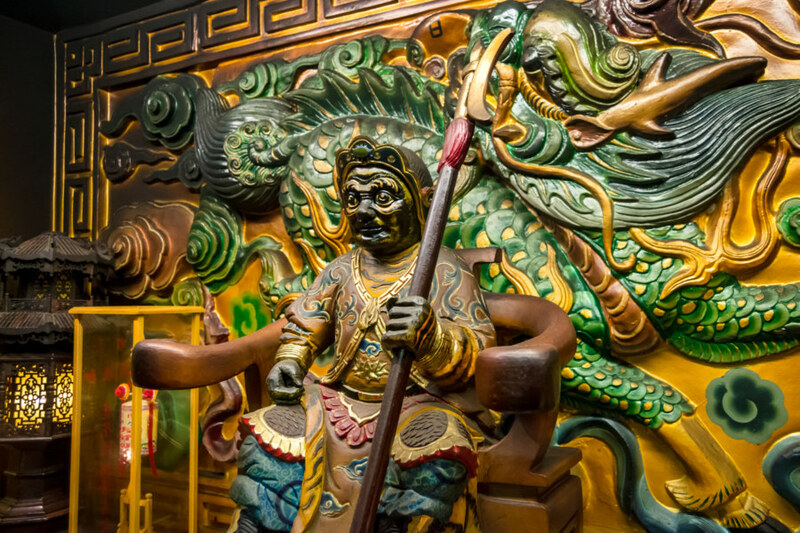 The tiger general, as he is also known, is most commonly found in association with Tǔ Dì Gōng 土地公, the land god, and is almost always located beneath an altar or table. 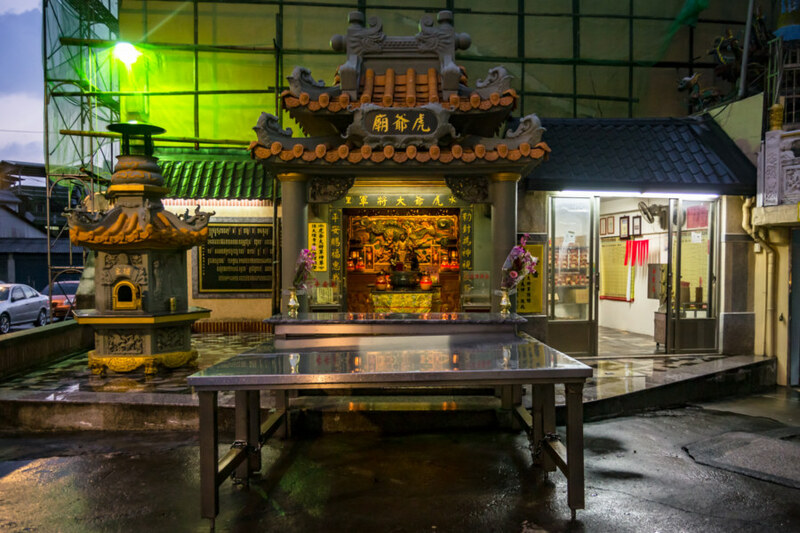 Here in this modest street-side shrine Hu Ye appears in the most venerable position on top of the altar—and in humanoid form! At first I didn’t recognize him, for he usually manifests as a rather cute tiger (of which there are several more scattered around the chamber), but if you look closely you’ll see stripes on this unusual idol. I am continually impressed with the capacity for Taiwanese temple culture to surprise and delight! The tiger general in humanoid form! Thus ends my initial report from a summer of road tripping in 2017. 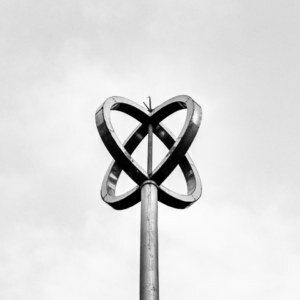 I’ve already published more than a dozen articles in this series and there are many more to come—so check back from time to time and you’ll find this post updated, wherever relevant.